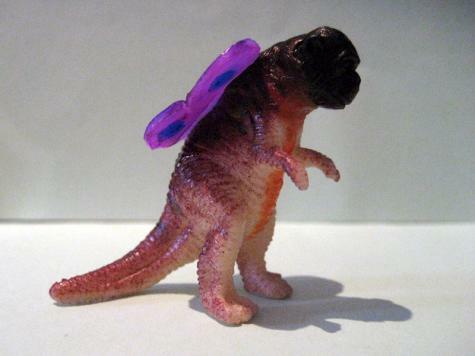 Mark has been using Plastimake to fuse plastic toy animals into unexpected hybrids. Today we meet a noble beast: the Winged Ape-Raptor. Stay tuned for more outlandish chimeras over the coming weeks! Here is a collection of cheap plastic animals I modified with Plastimake. It sticks to them like glue, allowing me to exchange heads, add wings, create horns, etc. I then coloured them with permanent markers. My daughter loves them (though she has forbidden me from doing it to any of her toys). One of the best, a horse with butterfly wings was sadly left in the hot car, not good when the Plastimake melted into the seat.